Another cause of long-term unemployment is unionization. High union wages that exceed the competitive market rate are likely to cause job losses in the unionized sector of the economy. Also, those who lose high-wage union jobs are often reluctant to accept alternative low-wage employment. Between 1970 and 1985, for example, a state with a 20 percent unionization rate, approximately the average for the fifty states and the District of Columbia, experienced an unemployment rate that was 1.2 percentage points higher than that of a hypothetical state that had no unions. On the economy, President Barack Obama signaled once again the ground is shifting -- this time with regard to unions. With his signature on three executive orders, President Barack Obama expanded workers rights and reversed Bush administration orders that were seen as anti-union. Then, the president said something that hasn't been heard in the Oval Office for a long time. "I do not view the labor movement as part of the problem, to me it's part of the solution," said President Obama. The stimulus bill passed by the House last night contains a controversial provision that would mostly bar foreign steel and iron from the infrastructure projects laid out by the $819 billion economic package. U.S. industrial giants including Caterpillar, General Electric and the domestic aerospace industry are emerging as strong opponents. The measures, they argue, could violate trade deals the United States has signed in recent years, including an agreement on expanding access to government procurements reached through the World Trade Organization. But most damaging, critics say, would be the "protectionist message" attached to imposing such barriers on foreign companies.Nations including China and many in Europe are preparing to spend billions of dollars of taxpayer money on stimulus projects. American companies are angling for a piece of those pies, and retaliatory measures against U.S. companies, executives argue, could significantly complicate those efforts. This week, a European Commission spokesman threatened countermeasures if the Buy American provisions are approved. I hope President Obama and his economists strongly oppose these first shots in a new trade war of protectionism. So far, the article says, "the administration has not addressed the issue publicly." Temporary, Targeted, and Timely - Not! David Brooks guesses what Larry Summers is, or should be, thinking about the stimulus bill. Harvard economist David Cutler is joining the Obama administration. There is little doubt that the new economic team is made up of some of the best and the brightest our profession has to offer. Compared to what I expected, Burt has more in equities in general and more in emerging markets in particular. (Emerging markets include the last three holdings on his list, plus a bit of the second, making up about a third of the total portfolio). To my surprise, he lists no specific allocation to real estate securities such as REITS or to inflation-protected bonds. What are some useful and objective measures which we can use to judge the performance of President Obama and his new team? How would Greg Mankiw judge Obama four years from now? Consider a related question: How would you judge the competence of a doctor if you could observe him treating only a single patient? What you would not do is judge him by the outcome. Even the best physicians have patients die. And even witchdoctors can have patients recover. Randomness is a fact of life (and death). In the case of a medical doctor, the answer seems clear: Instead of looking at the outcome, you would judge him by the decisions he makes and treatments he prescribes. That is, you would examine whether he followed best practices for the circumstances he faced. Similarly, randomness is a fact of economic life, and it would be a mistake to judge a president by the economic outcome during his administration. It is better to look at the decisions the president made, and to acknowledge that the outcome is a function of those decisions and many other factors not under his control. As an economist, I have views about what best practices are for economic policy, and I judge presidents by how closely they adhere to those principles. Unfortunately, that evaluation process is not quite as simple and objective as the reader might have hoped for. But I don't think there is a better alternative. Now some people may be tempted to read the above commentary and call it self-serving. After all, the economy looks pretty bad right now, so maybe I am trying to excuse President Bush and, indirectly, myself as one of his economic advisers. Not so. If you want to judge presidents and their economic advisers by outcomes, that would be all to my benefit. I arrived in Washington to head the CEA in February 2003 and left in February 2005. (Harvard has a two-year rule for faculty leave). During that time, the economy grew at a healthy annualized rate of 3.6 percent, and the unemployment rate fell half a percentage point. As judged by outcomes, I look pretty good! But I will be the first to admit that this argument is deeply silly. The Crimson reports that the Obama administration has recruited Harvard economists Jeremy Stein and Jeff Liebman, both excellent choices. Economists who have spent their entire careers on equilibrium business cycle theory are now discovering, in effect, that they invested their savings with Bernie Madoff. It is funny. I have a similar pedigree as Paul. Both of us have PhDs from MIT, and we learned a lot of our macro there. Both of us see the world through the lens of the Keynesian framework (by which I mean the IS-LM model, etc.) But we have very different perspectives on the equilibrium business cycle theorists. The difference may reflect our research paths. Most of Paul's research has been in international economics, and throughout his career, he could easily ignore equilibrium business cycle theory. By contrast, I have done a lot of work on "new Keynesian economics," which tries to fix the flaws in the Keynesian model that the equilibrium business cycle theorists pointed out. Perhaps that work has given me more appreciation for their contribution, as well as for the defects in the Keynesian worldview. When I teach graduate-level macro, no one shows up on my reading list more often than Robert Lucas, the father of equilibrium macro. In my view, the intellectual framework created by Lucas and Ed Prescott needs to be taken seriously by students of modern macro. I think they both richly deserved the Nobel Prize. And I hope they did not invest any of their winnings with Bernie Madoff. So only 8 percent of this spending occurs in budget year 2009, and only 41 percent occurs in first two years. Note that spending on transfer payments and tax relief occurs much faster than this: click through to the above link for details. Yale's Bob Shiller argues that confidence is the key to getting the economy back on track. I think a lot of economists would agree with that. The question is what it would take to make people more confident. Bob thinks that confidence would rise if the government borrowed more and spent more. Other economists think that confidence would rise if the government committed itself to, say, lower taxes on capital income. The sad truth is that we economists don't know very much about what drives the animal spirits of economic participants. Until we figure it out, it is best to be suspicious of any policy whose benefits are supposed to work through the amorphous channel of "confidence." Organized public works, at home and abroad, may be the right cure for a chronic tendency to a deficiency of effective demand. But they are not capable of sufficiently rapid organisation (and above all cannot be reversed or undone at a later date), to be the most serviceable instrument for the prevention of the trade cycle. there is a plausible diagnosis and a logically consistent argument under which fiscal stimulus could help: We are experiencing a strong portfolio and precautionary demand for government debt, along with a credit crunch. People want to hold less private debt and they want to save, and they want to hold Treasuries, money, or government-guaranteed debt. However, this demand can be satisfied in far greater quantity, much more quickly, much more reversibly, and without the danger of a fiscal collapse and inflation down the road, if the Fed and Treasury were simply to expand their operations of issuing treasury debt and money in exchange for high-quality private debt and especially new securitized debt. The bit you posted from John Cochrane is precisely what the TALF is about -- the joint Treasury-Fed facility aimed at securitized assets (consumer lending at first, but it could be scaled up to non-agency RMBS and CMBS). Around the econoblogosphere, John's piece is proving controversial. Harvard's Dani Rodik calls it the "best argument against a conventional fiscal stimulus that I have seen" and notes "since it is also very well written every macroeconomics student should read it in full." Meanwhile, Berkeley's Brad DeLong accuses John of making "an elementary, freshman mistake." Bill Easterly, one of my favorite development economists, has started a blog. I was on CNBC's Squawkbox this morning. Scenario 1. AmeriBank of Holland, Ohio, receives TARP funds and uses $20,000 to hire Joe the Plumber to remodel a bathroom in one of its banks. Scenario 2. AmeriBank of Holland, Ohio, receives TARP funds and loans $20,000 to Bob the Baker to remodel a bathroom in his house. Explain the difference in macroeconomic stimulus in these two scenarios. 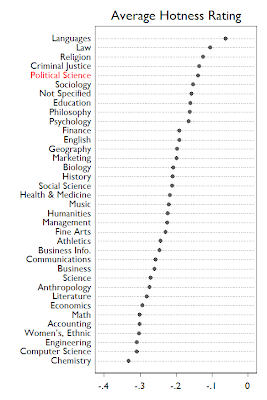 Crooked Timber presents this ranking of academic fields, based on the "hotness" ratings at RateMyProfessors. We econ profs don't do so well. Hmmm...maybe I should have finished that law degree I started. FYI, here is my ratings page, which makes me wonder whether any student takes this activity seriously. Every economist, as I've said, from conservative to liberal, acknowledges that direct government spending on a direct program now is the best way to infuse economic growth and create jobs. That statement is clearly false. As I have documented on this blog in recent weeks, skeptics about a spending stimulus include quite a few well-known economists, such as (in alphabetical order) Alberto Alesina, Robert Barro, Gary Becker, John Cochrane, Eugene Fama, Robert Lucas, Greg Mankiw, Kevin Murphy, Thomas Sargent, Harald Uhlig, and Luigi Zingales--and I am sure there many others as well. Regardless of whether one agrees with them on the merits of the case, it is hard to dispute that this list is pretty impressive, as judged by the standard objective criteria by which economists evaluate one another. If any university managed to hire all of them, it would immediately have a top ranked economics department. Biden knew what he was saying was false. Biden was saying what he believed to be true and somehow got this incorrect idea in his head without talking about the issue with the very talented team of economists working for the new administration. Biden talked to his economic advisers about the issue, and they purposefully misled him into thinking that there was a consensus among economists, even though there isn't. Biden's advisers were themselves mistaken. They expected an overwhelming consensus of support for their fiscal plans and were surprised at the number of prominent economists on the opposite side the issue. I have no idea which of these hypotheses is correct. I suspect it is either the first or last. But any one of them should make us uneasy about how well the new administration's economic decisionmaking apparatus is working. Update: A reader emails me a fifth hypothesis. Earlier in the same interview, Biden refers to "every economist that I've spoken to," and maybe that is the group he is referring to in this later quotation as well. In that case, as the reader suggests, "Biden needs to speak to a broader circle of economists." Click here to watch a great panel discussion from the University of Chicago about the economy and proposed fiscal plans. in terms of fiscal-stimulus proposals, it would be unfortunate if the best Team Obama can offer is an unvarnished version of Keynes's 1936 "General Theory of Employment, Interest and Money." The financial crisis and possible depression do not invalidate everything we have learned about macroeconomics since 1936. Much more focus should be on incentives for people and businesses to invest, produce and work. On the tax side, we should avoid programs that throw money at people and emphasize instead reductions in marginal income-tax rates -- especially where these rates are already high and fall on capital income. Eliminating the federal corporate income tax would be brilliant. On the spending side, the main point is that we should not be considering massive public-works programs that do not pass muster from the perspective of cost-benefit analysis. Update: Paul Krugman calls Barro's piece "boneheaded." Tyler Cowen comes to Barro's defense. From seven experts. Anna Schwartz's first question gets the award for Most Pointed. The devotees of the party in power are smug and arrogant. The devotees of the party out of power are insane. WASHINGTON -- It will take years before an infrastructure spending program proposed by President-elect Barack Obama will boost the economy, according to congressional economists. The findings, released to lawmakers Sunday, call into question the effectiveness of congressional Democrats' efforts to pump up the economy through old-fashioned public works projects like roads, bridges and repairs of public housing. Less than half of the $30 billion in highway construction funds detailed by House Democrats would be released into the economy over the next four years, concludes the analysis by the Congressional Budget Office. Less than $4 billion in highway construction money would reach the economy by September 2010. The economy has been in recession for more than a year, but many economists believe a recovery may begin by the end of 2009. That would mean that most of the infrastructure money wouldn't hit the economy until it's already on the mend. The CBO analysis doesn't cover tax cuts or efforts by Democrats to provide relief to cash-strapped state governments to help with their Medicaid bills. But it illustrates just how difficult it can be to use public investment to rush money into the economy. It usually takes bids and contracts to announce such developments, which invariably take time. Overall, only $26 billion out of $274 billion in infrastructure spending would be delivered into the economy by the Sept. 30 end of the budget year, just 7 percent. Just one in seven dollars of a huge $18.5 billion investment in energy efficiency and renewable energy programs would be spent within a year and a half. I mentioned an earlier version of this paper a while back, but a reader emails me that it is now available as an NBER Working Paper. What are the Effects of Fiscal Policy Shocks? We propose and apply a new approach for analyzing the effects of fiscal policy using vector autoregressions. Specifically, we use sign restrictions to identify a government revenue shock as well as a government spending shock, while controlling for a generic business cycle shock and a monetary policy shock. We explicitly allow for the possibility of announcement effects, i.e., that a current fiscal policy shock changes fiscal policy variables in the future, but not at present. We construct the impulse responses to three linear combinations of these fiscal shocks, corresponding to the three scenarios of deficit-spending, deficit-financed tax cuts and a balanced budget spending expansion. We apply the method to US quarterly data from 1955-2000. We find that deficit-financed tax cuts work best among these three scenarios to improve GDP, with a maximal present value multiplier of five dollars of total additional GDP per each dollar of the total cut in government revenue five years after the shock. Retailers should simply round down the total checkout tally for cash purchasers and not handle pennies at all. There will be no need for pennies in change and anyone who wants to use pennies to pay, can put them in a charity jar instead. The first retailer to do this will reap a PR bonanza and others will quickly follow. Within a couple of years, retailers who don’t round down will be as rare as those who don’t accept credit cards. Not getting pennies in change, like being able to pay with credit cards, will be considered a birthright. Concord Teacakes found this posting and is going to DO IT. In Concord, MA (The birthplace of Civil Disobedience), on February 12 (LIncoln’s 200th birthday) they are going to refuse pennies, starting at (time subject to change) 9:00 AM. Be there — it’s opposite the West Concord train station. From University of Chicago economist Luigi Zingales. What’s been disturbing, however, is the parade of first-rate economists making totally non-serious arguments against fiscal expansion. You’ve got John Taylor arguing for permanent tax cuts as a response to temporary shocks, apparently oblivious to the logical problems. You’ve got John Cochrane going all Andrew-Mellon-liquidationist on us. You’ve got Eugene Fama reinventing the long-discredited Treasury View. You’ve got Gary Becker apparently unaware that monetary policy has hit the zero lower bound. And you’ve got Greg Mankiw — well, I don’t know what Greg actually believes, he just seems to be approvingly linking to anyone opposed to stimulus, regardless of the quality of their argument. If Paul really wants to know what I believe, he can read what I have written on the subject. Let me make one thing clear: When I link to another economist here on this blog, it is typically because I think his or her arguments are worth hearing and thinking about, not necessarily because I agree with all of them. I don't have the time (and, in some cases, expertise) to offer a refereeing service for every article I mention. So when I say, "Here is an article by Professor X," I mean "Here is an article by Professor X," not "Here is an article by Professor X, and I approve of everything he says." In recent weeks, I have linked to Christy Romer making the case for the Obama fiscal stimulus as well as many economists on the opposite side the debate. It is true that I have linked more to those opposed. That is partly a reflection of my opinion on the issue. It is also partly to provide a counterpoint to the view disingenuously promoted by some members of the incoming administration that almost all major economists are lined up behind their stimulus plans. As Paul's list of prominent stimulus skeptics documents well, that is simply not the case. Some of this infrastructure spending may be very worthwhile-I return to this issue a bit later- but however merited, it is difficult to believe that they would provide much of a stimulus to the economy. Expansion of the health sector, for example, will add jobs to this sector, but it will do this mainly by drawing people into the health care sector who are presently employed in jobs outside this sector. This is because unemployment rates among health care workers are quite low, and most of the unemployed who had worked in construction, finance, or manufacturing are unlikely to qualify as health care workers without considerable additional training. This same conclusion applies to spending on expanding broadband, to make the energy used greener, to encourage new technologies and more research, and to improve teaching. An analysis by Forbes publications of where most jobs will be created singles out engineering, accounting, nursing, and information technology, along with construction managers, computer-aided drafting specialists, and project managers. Unemployment rates among most of these specialists are not high. 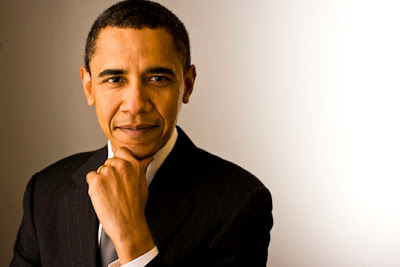 The rebuilding of "crumbling roads, bridges, and schools" highlighted by in various speeches by President Obama is likely to make greater use of unemployed workers in the construction sector. However, such spending will be a small fraction of the total stimulus package, and it is not easy for workers who helped build residential housing to shift to building highways. A second crucial issue relates not to the amount of new output and employment created by the stimulus, but to the efficiency of the government spending. Efficiency is not likely to be high partly because of the fundamental conflict between the goal of stimulating employment and output in order to reduce the severity of the recession, and the goal of concentrating infrastructure spending on projects that add a lot of value to the economy. 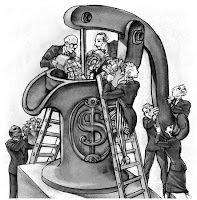 Stimulating the economy when employment is falling requires rapid spending of this huge stimulus package, but it is impossible for either the private or public sectors to spend effectively a large amount in a short time period since good spending takes a lot of planning time. Putting new infrastructure spending in depressed areas like Detroit might have a big stimulating effect since infrastructure building projects in these areas can utilize some of the considerable unemployed resources there. However, many of these areas are also declining because they have been producing goods and services that are not in great demand, and will not be in demand in the future. Therefore, the overall value added by improving their roads and other infrastructure is likely to be a lot less than if the new infrastructure were located in growing areas that might have relatively little unemployment, but do have great demand for more roads, schools, and other types of long-term infrastructure. At a time of unique challenges to the global financial system, it is imperative to have members of Congress with a sophisticated understanding of economics. Economic stimulus that includes government spending should be carefully designed to ensure that only projects that have social value are funded. Infrastructure projects, identified by an objective panel, that likely would have been pursued without special funds are good candidates. If there are insufficient projects meeting a high cost-benefit threshold, additional stimulus should come in the form of tax cuts. Any mitigation of greenhouse gas emissions in the United States should be pursued through market mechanisms that raise revenue, which can be used to reduce the personal, corporate and/or payroll tax. The U.S. should make long-term investments in human capital, particularly in early childhood education for low-income and disadvantaged children. Congress should promote free trade and work to reduce trade barriers around the globe. The best way to deal with the political costs of trade and the economic dislocation caused by international competition is to create a meaningful safety net for displaced workers. Tax reform is necessary to improve the equity, efficiency and simplicity of the tax code. A priority of tax reform should be a reduction in the number of special incentives that narrow the tax base, induce tax avoidance and increase compliance costs. The U.S. must deal with the looming fiscal obligations created by our entitlement programs: Medicare, Medicaid, and Social Security. Our current economic situation justifies increased deficits now, but today's policy must be attentive to the need for fiscal balance over the next several decades. If you agree, you can endorse these ideas here. Goodness knows, President-elect Obama has his legislative hands full. Maybe that explains why he has taken the idea of increasing gasoline taxes off the table, saying that Americans had enough economic burdens at the moment. Nominees like Steven Chu, the Nobel Prize winning physicist who will become Energy Secretary, dutifully echoed Obama's view even though in Chu's case he has long supported higher fuel taxes. Click here for the just released Economic Report of the President. As Andrew Lo of M.I.T. has demonstrated, if stock traders make a series of apparently good picks, the dopamine released into their brains creates a stupor that causes them to underperceive danger ahead. FYI, the new and growing field of neuroeconomics makes two appearances in the the latest edition of my favorite textbook. If you have a copy, check the index. Update: More on the biological roots of the financial crisis. Zimbabwe is introducing a Z$100 trillion note, currently worth about US$30. John Cochrane, a professor at the University of Chicago Booth School of Business, says that among academics over the last 30 years, the idea of fiscal stimulus has been discredited and in graduate courses, it is "taught only for its fallacies." New York University economist Thomas Sargent agrees: "The calculations that I have seen supporting the stimulus package are back-of-the-envelope ones that ignore what we have learned in the last 60 years of macroeconomic research." From Martin Baily (CEA Chair for President Clinton) and Charles Schultze (CEA Chair for President Carter). Bloomberg reports that the Ted spread is now below 100 basis points. The Ted spread, the difference between the interest rates on interbank loans and T-bills, is one gauge of how much fear is gripping the financial system. Its decline suggests that the TARP is working and is certainly good news. I've enjoyed your stirring the pot on the great stimulus discussion in recent weeks. One thing I haven't seen much discussion of is the idea that there are intertemporal tradeoffs involved. Suppose, for purposes of discussion, that stimulus does actually work, but that taxpayers do ultimately have to pay for it. In that case, there is a tradeoff between increasing economic welfare in the short-run and reducing economic welfare in the long-run (because of the distortions of raising taxes). Are there any well-established macro models that provide some guidance on how that balancing should be done? 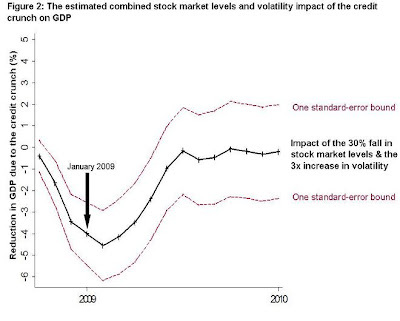 Many analysts seem to believe that the stimulus should be sized to close as much of the output gap as possible. But it isn't obvious to me that's true if, in a perfect world, we are balancing the short-term gains against long run costs. The reader is right that this consideration has not gotten much attention of late. Why? I suspect the answer is that those who are most confident in Keynesian policy prescriptions are most skeptical about the distortionary effects of taxation. To put it perhaps a bit too bluntly, the Keynesian mutliplier is about income effects, while neoclassical tax distortions are about substitution effects. For those of us eclectic enough to see the world including a variety of effects, both Keynesian and neoclassical, policy decisions are far harder than they are for those eager to focus on one effect while setting the other close to zero. You can guess which effect those on the far left and those on the far right choose to focus on. Jim Tobin once addressed this issue, saying, "It takes a heap of Harberger triangles to fill an Okun's gap. "* That is a great slogan for the Keynesian team. But I agree with the reader that it would be better to go beyond quips and try to quantify the issue with real data and real models. (PhD students: Take note of a possible dissertation topic.) In light of the looming tax increases that may well occur over the next few decades to finance promised entitlement programs for the elderly, Harburger triangles loom larger now than they did in Tobin's day. * For economists under the age of 40, who may be less familiar with these archaic terms: A Harberger triangle is the area in a supply and demand diagram that measures the deadweight loss of taxation. An Okun's gap is the loss in output and employment when the economy falls below potential because of insufficient aggregate demand. Stanford's Nick Bloom and Max Floetotto say, "economic uncertainty is now dropping so rapidly that we believe growth will resume by mid-2009." The latest from Ed Glaeser. Terry Gross interviews one of my favorite economists. A nice overview from Glenn Rudebusch. Thanks to the advent of credit derivatives -- financial contracts that allow investors to speculate on or protect against default -- we can now observe how likely global markets think it is that Uncle Sam will renege on America's mounting debts. Last week, markets pegged the probability of a U.S. default at 6 percent over the next 10 years, compared with just 1 percent a year ago. Perhaps their [Romer and Bernstein's] estimates of the stimulus provided by direct government spending are in the right ballpark, but I tend to believe that they are excessive. For one thing, the true value of these government programs may be limited because they will be put together hastily, and are likely to contain a lot of political pork and other inefficiencies. For another thing, with unemployment at 7% to 8% of the labor force, it is impossible to target effective spending programs that primarily utilize unemployed workers, or underemployed capital. Spending on infrastructure, and especially on health, energy, and education, will mainly attract employed persons from other activities to the activities stimulated by the government spending. The net job creation from these and related spending is likely to be rather small. In addition, if the private activities crowded out are more valuable than the activities hastily stimulated by this plan, the value of the increase in employment and GDP could be very small, even negative. We are in the midst of a crisis caused by so many financial institutions borrowing too much money. Somehow, a critical mass of policy makers now believes that the correct response is for the U.S. government to borrow too much money. I usually don't respond to blogosphere commentary on my work because, after all, time is scarce. But this critique by Nate Silver is noteworthy because the error it makes is so fundamental. It offers a teachable moment. The paper (.pdf) Mankiw refers to, written by Berkley Economists Christina and David Romer, is the sort of thing that will make your head spin. But the gist of it is that (i) It is very important to differentiate the motivation for different types of tax cuts or tax increases, and (ii) a certain type of tax cut or tax increase may have a much larger effect on growth than is generally acknowledged. The type of tax cut that Romer and Romer think falls into this category is what they call an "exogenous" tax cut -- one designed not to counter business cycles, but rather a "spontaneous" tax cut under relatively healthy economic circumstances. This is very much not the type of tax cut that we are contemplating right now. Essentially, Silver says that the Romers study exogenous tax changes, the tax changes now being contemplated in DC are not exogenous, and therefore the multipliers estimated by the Romers do not apply to thinking about current policy. This argument raises the question: Why did the Romers focus on exogenous policy changes? The reason is that these are the only changes that can be used to reliability identify the effects of tax policy. If a tax change is made in response to some event, call it X, that influences the economy, it is hard to disentangle the effects of the tax change from the the direct effects of X. The Romers focus on exogenous tax changes for the same reason doctors conduct randomized drugs trials--not because they are interested in randomization as a prescriptive tool, but because randomization solves a statistical identification problem. Imagine if a clinical doctor reasoned the same way as Silver did. He would say, "All the evidence on the effects of this drug are from randomized drug tests. In my practice, I never randomize treatment of my patients. Therefore, I can safely ignore the results from the randomized experiments." That is, of course, fallacious. We need the randomized experiments to inform us about the effects of medical interventions, even though interventions in practice are rarely randomized. Similarly, we need to consider the effects of exogenous tax changes, even though many actual tax changes are not at all exogenous. A student at Benedictine College saw this sign and notes, "I could not help but smile and appreciate the presence of the economic theory of incentives in my everyday life." Click here to read my piece in tomorrow's NY Times. Team Obama has released its analysis of fiscal stimulus, coauthored by CEA Chair-designate Christina Romer and Vice President-elect adviser Jared Bernstein. If you go to the penultimate page, you can find the fiscal policy mutlipliers they assume. For government purchases, their multiplier is 1.57; for taxes, 0.99.
tax changes have very large effects on output. Our baseline specification suggests that an exogenous tax increase of one percent of GDP lowers real GDP by roughly three percent. Our many robustness checks for the most part point to a slightly smaller decline, but one that is still well over two percent. That is, Team Obama assumes that tax changes are less than half as potent in influencing the economy as the new CEA Chair estimated them to be in her own research. Of course, it is prudent to take any research, including that of the very careful, very sensible Romers, with a grain or two of salt. The same can be said of the mainstream models on which Team Obama is relying. The chief executive of Exxon Mobil Corp. for the first time called on Congress to enact a tax on greenhouse-gas emissions in order to fight global warming. In a speech in Washington, Rex Tillerson said that a tax was a "more direct, a more transparent and a more effective approach" to curtailing greenhouse gases than other plans popular in Congress and with the incoming Obama administration. Reported by the Wall Street Journal. A friend sends along this photo of a sock puppet, created by (believe it or not) some White House interns. I am told the puppet is supposed to be of a generic "smart person." He certainly has good taste in reading material. Democratic Gov. Theodore R. Kulongoski's upcoming budget calls for a highway tax based on mileage, not gasoline purchases.A state task force will look at equipping every new vehicle in Oregon with a Global Positioning System to record every mile driven and where. Motorists would pay at the gas pump based on how much they drove, no matter how fuel-frugal their vehicle. This makes sense if you are trying to tax road use and congestion but don't particularly care whether people are driving SmartCars or Hummers. On the other hand, as long as politicians and the public are concerned about fuel efficiency and carbon emissions, as they seem to be, it makes more sense to stick to the more standard gasoline tax. One possible advantage for the GPS system: You can potentially calibrate the level of the tax to the degree of congestion on the particular road at the particular time of day, so the tax better reflects the changing externality associated with driving. There is no evidence in the article that this varying charge is envisioned, however. I am a faithful reader of your blog and have used your intro text (were I still teaching intro, I'd use it again, although the price is off-putting). I am writing about Gov. Kulongoski's weight-use mile tax proposal,which deserves, I think, a closer look. The tax is not primarily aimed at gasoline consumption, but is a charge for highway use. The base rate proposed is a quadratic function of axle-weight, times the number of axles and miles travelled, which together with vehicle speed, determines highway wean and tear. However, lighter axle-weight is correlated with fuel consumption (as is speed) and highly fuel efficient vehicles are already eligible for state subsidy. Of course, one critical advantage of the proposal is that: "You can potentially calibrate the level of the tax to the degree of congestion on the particular road at the particular time of day, so the tax better reflects the changing externality associated with driving." This is, indeed, contemplated in the Gov's proposal,although it is not included in the 2009-11 budget. In the longer run, congestion-pricing will also be useful in maintaining the existing transportation network and necessary for planning its expansion. Moreover, there is not much sense in building the GPS system if you aren't contemplating congestion pricing. The proposal also contemplates the incorporation of vehicle speed into the base rate in the future. However, like congestion pricing, OR's Department of Transportation hasn't done enough experimentation with this option to understand how it to make it work. Here's an interesting fact that you may not have seen yet. 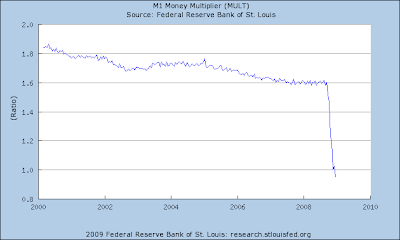 The M1 money multiplier just slipped below 1. So each $1 increase in reserves (monetary base) results in the money supply increasing by $0.95 (OK, so banks have substantially increased their holding of excess reserves while the M1 money supply hasn't changed by much). Both President-elect Barack Obama and Vice President-elect Joe Biden will huddle with Democratic and Republican congressional leaders on Monday to try to advance a huge economic stimulus bill that Obama hopes can be enacted quickly, despite Republican reservations. Obama's transition team said it is mulling "buy American" provisions for the stimulus package that could favor U.S. companies over foreign competitors. Let's hope Larry Summers and Christy Romer are successful at beating back this bad idea. N.B. : These figures include all federal taxes, not just income taxes. As seen by The Economist. N.B. : Six of the eight have been either Harvard students or Harvard faculty at some point during their careers. And the other two were once targets of Harvard recruitment efforts, which sadly proved unsuccessful. Here is the previous installment by The Economist.